Lease transfer of fully furnished 4 ½ (2 bedroom) apartment from 1 May to 31 August. -fully furnished with hardwood floors, 2 large bedrooms, a large living area, bathroom, and kitchen -located on third floor with access to rooftop -laundry access in the connecting building -apartment equipped with intercom and ADT security alarm. -located in the Lower Plateau/ Latin Quarter; less than 5 minutes from Berri-UQAM station, with orange, green, and yellow lines making it easy to get anywhere in the city! 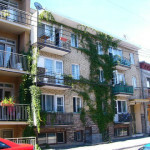 -steps from rue St-Denis, with lots of choices for restaurants, bars, grocery stores, and more! 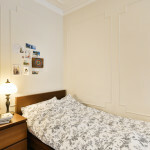 -Walking distance to McGill and UQAM, short commute to other schools. Students are very welcome! Rent is $1230, including all furniture, oven, fridge, microwave, and hot water. Heat/electricity and wifi not included. Transfert de bail d’un appartement meublé de 4½ (2 chambres) du 1er mai au 31 août. 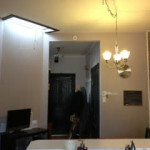 -meublé avec 2 grandes chambres, un grand salon, une salle de bains et une cuisine -situé au troisième étage avec accès au toit - ccès de blanchisserie dans l’immeuble -appartement équipé avec intercom et un alarme de sécurité ADT. -situé dans le Sous-Plateau / Quartier Latin; à moins de 5 minutes de la station Berri-UQAM, avec les lignes orange, verte et jaune, qui vous permettant de vous déplacer facilement dans la ville! - a côté du rue St-Denis, avec beaucoup de choix de restaurants, bars, épiceries et plus! -les étudiants sont bienvenus! Le loyer est de 1230 $, y compris tous les meubles, four, réfrigérateur, micro-ondes et eau chaude. Chauffage / électricité et wifi non inclus. La maison du plateau The plateau house is located on the top floor of a triplex.It includes 4 bedrooms, 1 bathroom a kitchen, a dining room and a lounge. Located at the heart of Plateau activities, east of St-Laurent Street and McGill University Campus, the Plateau House is crowned by Prince Arthur Street and Pine Avenue and at the beginning of the McGill Ghetto. . This area is full of life, you can do everything on foot, go to town for shopping, go to see a show or just go shopping in the neighborhood, it's really a central area.All the bars and discotheques are located around the Maison du Plateau. A walk in the McGill ghetto is very enjoyable. You can cross the McGill campus, located to the west which is an exceptional site, filled with flowers, greenery and climbing the mountain. Boulevard Saint-Laurent is the center of Montreal, where you will find all its shops, restaurants and cafés of all ethnic origins. If you want to live within walking distance of life's necessities then this is the perfect place. With an outstanding Walk Score of 97 the building is only a few minutes’ walk from the shops and restaurants of St-Denis Street and Mont-Royal Avenue. Close to McGill and UQAM the building has many amenities to be social including a sauna a rooftop terrace laundry room and indoor parking. Welcome to your home with stunning views of Downtown Montreal! Close to the Sherbrooke bus route McGill and UQAM Universities and right downtown amidst shopping restaurants entertainment and other services this building provides you with all the conveniences and amenities you need. Enjoy the beauty and nature of Lafontaine Park which is located just in front of the building. Endroit calme et paisible. Situé près du métro Sherbrooke à 15 min de centre-ville et de toutes les universités ( UQAM, Concordia, McGill). 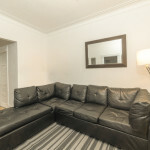 Une co-location: Avec une belle grande chambre (meublé sur demande), près de restos, bistros, et cafés, du métro . Ne laissez pas passer cette opportunité, réservez pour visiter cette grande chambre. Quiet and peaceful place. 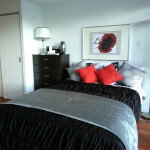 Located near metro Sherbrooke 15 minutes from downtown dans universities ( UQAM, Concordia, McGill) . 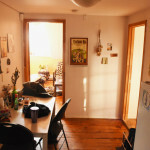 A co-location: With a nice big room (furnished on request), near restaurants, bistros, and cafes, the metro. Do not miss this opportunity to visit this great book room. Milton-Clark House The Milton-Clark House is a pretty house built on two floors. The ground floor has 3 bedrooms, a nice bathroom and a laundry room. In the second level, there are 3 bedrooms, a bathroom, a kitchen, a dining room and a lounge with a skylight. Located near the McGill University campus, Milton-Clark House is located east of the McGill ghetto. This neighborhood, full of life, where you can do everything on foot, go to downtown to see a show or just go shopping. It's really a central area with its Victorian and very Anglo-Saxon architecture. A walk in the McGill ghetto is very enjoyable. You can cross the McGill campus, located to the west which is an exceptional site, full of flowers, greenery and walk to the mountain. If you go east, there is St. Laurent Boulevard with all its shops, restaurants and cafes of all ethnic origins. 3 bedrooms/3 chambres à louer de Jan à Mai 2017- Plateau- Duluth English will follow À louer de Janvier 2017 à May 2017- Étudiants Complètement meublé avec Laveuse et sécheuse À louer de Janvier 2017 à fin Mai 2017 pour colocation étudiants. Au coeur du Plateau, appartement 5 ½ chaleureux et lumineux, avec 2 balcons, situé au coin de la rue Duluth, entre St Denis et St Laurent. Cuisine et aire salon et salle à manger ouverte, 3 chambres fermées. Logement entièrement meublé et fonctionnel Situé au deuxième étage d'un triplex centenaire, cet appartement peut accommoder jusqu'à 6 personnes avec 3 chambres fermées, incluant un lit queen, 2 lits Linge de maison (draps, duvet, etc. et serviettes inclues).La cuisine est équipée (tout pour le repas) d’une cuisinière et four Bosh, avec les électroménagers (réfrigérateur, Toaster, boiler, et machine à café). La salle de bain est équipée d’une laveuse et sécheuse. L'appartement est également équipé de connexion internet WIFI illimitée. Pas de télé.2 balcons, un côté cour et l’autre côté rue. Les frais d’électricité ne sont pas inclus Le boulevard St Laurent , la rue Duluth, ainsi que la rue St-Denis sont au coeur de la vie sociale de la ville de Montréal, avec une pléiade de restaurants, cafés et boutiques, tous accessibles à quelques minutes de marche de cet appartement. Au centre du plateau, le village gay, McGill, le Parc Lafontaine, sont également à quelques instants de marche. Une station de BIXI est juste en face de l’appartement. Le métro Sherbooke ou Mont-Royal, à 10 minutes de marche. For Rent fromJan 2017 till May 2017- Students Fully furnished, with internet, washer and dryer This 2nd floor 3 Bedroom/1 Bathroom gem is located in the heart of Plateau steps from Duluth Ave. Fits 6 people with 3 bedrooms. Each of the bedrooms has a double bed. The kitchen design is open, and it's fully equipped. The bathroom has a bathtub with shower head. We provide unlimited WIFI so you can stream your shows online. Our location is unbeatable, we are on a quiet picturesque street just steps from famed Duluth Street, a couple of blocks from Saint Laurent and Saint Denis with so many options for shopping, restaurants, and entertainment. Parc Mont Royal Parc LaFontaine are both less than a 10 minute walk McGill university, Places des Arts, and Sainte Catherine St are all within a 15-20 minute walk. There's a bike rental station bixi very facing the apartment, except in the winter months. Upper duplex apartment 3 bedrooms, 1 bathroom. Open concept kitchen snd dining area . Hard wood floors. Modern appartment. Includes stove, refridgerator, microwave. Access to front and back balcony. Utilities like Hydro electricty or internet are not included. In the heart of the Plateau-Mont-Royal. 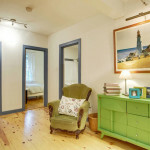 Walking Distance to Mcgill University. An excellent location-near many restaurants and cafes, specilaty food stores/super markets, pharmacies & banks. 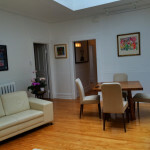 It has easy access to Sherbooke, St-Laurent, Place des Arts Metro stations, walking distance to Hotel Dieu Hospital. Close distance to Jean-Mance and Mont-Royal Park. Week-end or week-day evening appintments. Please email psamanez@yahoo.com or call for appointment Patty 514-815-8736. Stratégiquement situé à l'angle du boulevard René-Lévesque et de la rue Saint-Denis, au cœur du Quartier latin, le condo est proche de Quartier des spectacles, place des arts, Quartier chinois, vieux Montréal etc. En face de CHUM, 5 minutes à pieds de Metro Berri-Uqam ou Champ de mars et 5 minutes à pieds de Bibliothèque et Archives nationales du Québec. Vous trouvez dans le centre de la ville de Montréal, plein de restaurants, cinéma, théâtres... Le Metropol compte 15 étages, avec gymnase, chalet urbain et piscine sur le toit. Vous aurez une chambre à coucher, un salon et une cuisine, une salle de bain, l'eau chaude inclus, internet dans le bâtiment, gym, piscine et terrasse. Vous aurez agent de sécurité sur le lieu tous les soirs. Hey all of you coming or staying in Montréal from January on! I am looking for somebody who would be interested to overtake my room ;)! The room will be available from January on and can be rented either for 4 months or longer. Since I am here for exchange I bought all the kitchen and living equipement, which I won't take home. So you could overtake everything you need without an extra cost. The apartment includes an own bathroom and is located in the 8th floor of the residence. The residence itsself includes everything you can imagine.. a own gym, a laundry room, a kitchen on each floor, a study area, a common area where all the people meet and a reception where you can ask everything you need (and where they offer coffee for free and even breakfast on wednesday and friday). So in my opinion choosing that residence is the perfect choice if you wanna meet a lot of people and make new friends with whom you also live together! 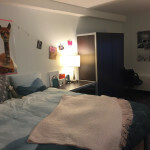 The location of the residence is literally perfect for a Student. It's between downtown (the american part I would say) and Plateau (the cool french area where almost all the cafés,clubs and bars are). So you only need 10 min max. by walk to be either in the city centre or at the plateau area. Furthermore many main bus lines hold directly 50 m apart from the residence and top of that there are many cafés and food shops in the street and a big supermarket directly in front of the residence. So if you are interested to live here feel free to contact me via e-mail: hermann-katharina@gmx.de or phone +1 514 431 8206. If you take it as a Double room the rent is 600CA$/month and if you take it as a Single Room it's 1149CA$/month.